Garry Williams is an American football offensive tackle for the Carolina Panthers of the National Football League. 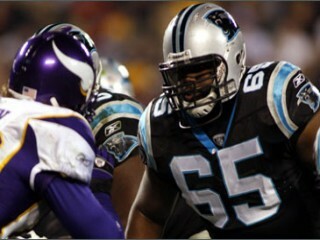 He was signed by the Panthers as an undrafted free agent in 2009. He played college football at Kentucky. Signed as an undrafted rookie free agent by Carolina (5/1/09). Played in seven games and dressed but did not play in one...Inactive for eight games...Appeared primarily on special teams...Only undrafted rookie free agent signed by Carolina in 2009 to play during the season. Three-year starter at Kentucky...Played in 45 games with 39 starts...2008 (Sr.): Second-team All-SEC choice...Selected as the team's most outstanding offensive lineman...Started 11 games at left tackle...Missed two games with a knee injury...Provided protection for the Wildcats to rank first in the conference for the fewest sacks allowed with 13...Surrendered only one sack in 428 pass plays...2007 (Jr.): Second-team All-SEC selection...Started 13 games...Part of offensive line that helped set a school single-season record for most points scored with 475...2006 (So. ): Named the team's most outstanding offensive lineman...Started final 12 games at left tackle...2005 (Fr): Played in eight games, starting the last three at left tackle after Fatu Turituri went out with injury. Attended Seneca HS in Louisville, Ky....Majored in community communications and leadership development at Kentucky. View the full website biography of Garry Williams.